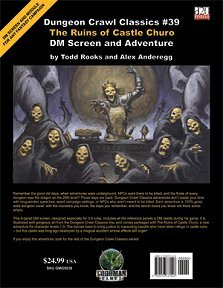 Publisher's blurb: "This 8-panel DM screen, designed especially for 3.5 rules, includes all the reference panels a DM needs during his game. It is illustrated with gorgeous art from the Dungeon Crawl Classics line, and comes packaged with The Ruins of Castle Churo, a new adventure for character levels 1-3. The heroes have to bring justice to marauding bandits who have taken refuge in castle ruins Ã± but this castle was long ago destroyed by a magical accident whose effects still linger!"